As the game moved along and the zeros mounted, Class A Advanced Buies Creek pitching coach Drew French was not surprised by what he was seeing. This type of outing from Hector Perez had been in the offing for some time. 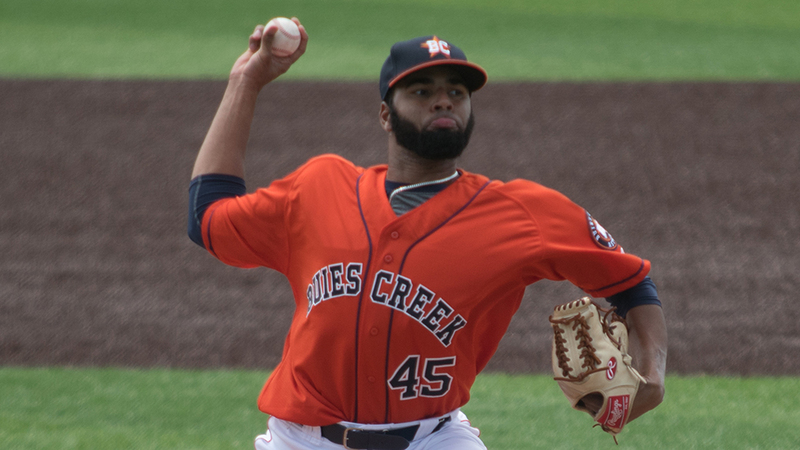 The Astros' 10th-ranked prospect tossed his first career complete game as Buies Creek blanked Myrtle Beach, 6-0, to complete a sweep of Tuesday's doubleheader at TicketReturn.com Field. Perez scattered seven hits over seven innings and struck out eight without walking a batter. "This outing was coming. This wasn't a surprise to anybody on our team," French said. "We know the potential Hector has and what he's capable of. Tonight was as simple as him commanding his fastball and using his secondaries throughout the game. His execution was great and there weren't a lot of wasted at-bats. He was ahead, 0-2 or 1-2, on the first nine batters of the game. When you can establish that type of dominance early, you'll be tough to beat." Armed with a 3-0 lead before he took the mound, Perez (3-2) worked around a throwing error by catcher Carlos Canelon in the first and a two-out single by Connor Myers in the second. He allowed a base hit to Andruw Monasterio in the third and two more in the third to Cubs No. 25 prospect Wladimir Galindo and Myers. Perez fanned Austin Upshaw to end the inning and gave up another single in the sixth to Galindo, who was erased on an inning-ending double play. "This is my third time [as a coach] with Hector," French said. "That was the best outing I've seen from him in terms of efficiency, getting ahead in the count and putting guys away. He was out there with a plan and purpose and he's blossoming into what we all knew he could be. I hope that momentum continues for him." Kevonte Mitchell singled and Zach Davis doubled to put two runners in scoring position in the seventh, but Perez retired Monasterio on a comebacker to complete the Astros' Carolina League-leading 11th shutout of the season. The 22-year-old has thrown 14 consecutive scoreless innings over his last three appearances, including one start, to bring his ERA down to 3.62. "We had the bullpen rocking at that point," French said. "The last batter was going to be it for him, regardless, but we were happy on a number of levels. Getting him through that seventh inning was big for his confidence. It's a nice benchmark to him through that barrier and it's important for his career moving forward. As he gets up to Double-A and beyond, he's going to need to learn how to pitch deep every five days." Signed as an undrafted free agent in 2014, Perez has limited opponents to a .187 batting average through 15 games, including 10 starts. He's struck out 74 over 64 2/3 innings, which includes a career-high 12 against Down East on June 8. Per the Astros' philosophy, Perez has "piggybacked" with other starters out of the bullpen to limit his innings. "That's something we like to do as an organization," French explained. "It helps monitor their workload and cuts them short for an outing or two each month. But either way, it all shines down on the fastball command. We know he's got a real big arm, a power slider and a developing splitter. But the fastball to quality location will be key to his career. He's got a supreme focus during and in between his starts." Bryan De La Cruz drove in two runs, while Jacob Meyers and Cody Bohanek had two hits apiece for Buies Creek, which won the opener, 4-2. Myrtle Beach starter Bryan Hudson (4-7) was charged with four runs -- three earned -- on six hits over four innings. The 24th-ranked Cubs prospect walked three and struck out three in losing his third straight start.